One spot where you definitely DO NOT WANT TO STAND during a lightning storm is next to an oil tank battery. These structures have a strong tendency of being a lightning attractant. Shortly before nine o’clock this evening that’s exactly what happened in northern Stafford County. 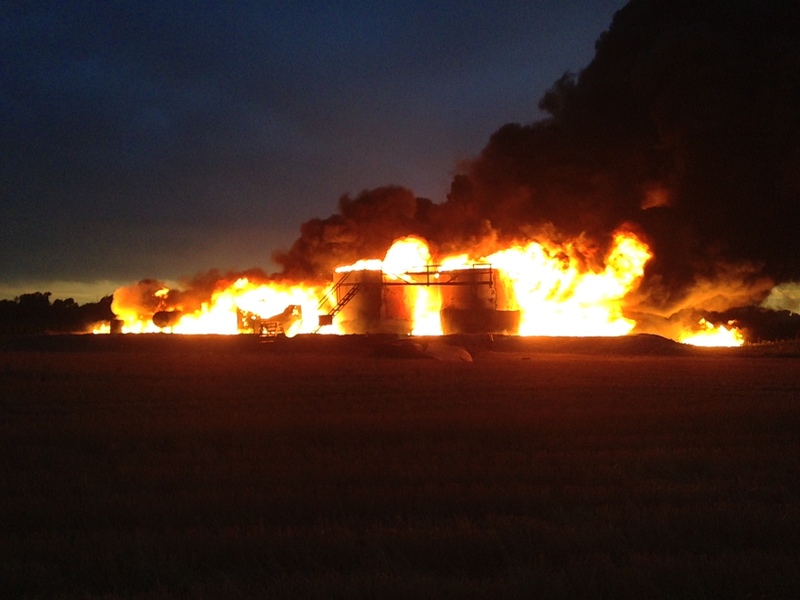 An oil tank battery located a quarter mile south of 170th Street – just west of Highway 281 – was struck by lightning. The photo of the fire was taken shortly after firefighters arrived on scene. Firefighters from three stations responded to the fire. The firefighters cooled the perimeter to prevent the surrounding grassland from igniting. Once the fire had burned down to an extinguishable level they applied a blanket of foam to the battery. Firefighters remained on scene for two hours.